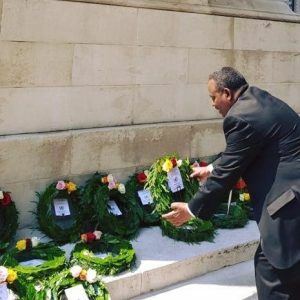 Deputy Head of Mission, Mr Ababi Demissie, laid a wreath at the Cenotaph in London on 23rd May, in memory of UN Peacekeepers from Ethiopia and around the world, who have lost their lives in the name of peace. Among those who attended the ceremony were veterans of the UN Veteran Association, Tessy Antony, Princess of Luxembourg, Lord Ahmad Minister of State for the UN and the ambassadors, defence attachés, and representatives of 110 different Embassies and High Commissions. The memorial ceremony also marked the 70th anniversary of the establishment of the first UN peacekeeping mission. From the early days of UN peacekeeping to some of today’s most vital operations, Ethiopian men and women have played an important role in the Organization’s efforts to advance peace in the world’s hot spots. Ethiopia’s participation in UN-authorised operations dates back to 1951, as part of the UN multinational force in the Korean War. Ethiopia participated in a Security Council authorized UN military presence to restore order in the Republic of the Congo. Ethiopian troops are seen here in Debre Zeit before departing for the Congo in July 1960. Ethiopia is the largest troop contributor to UN peacekeeping with over 8,300 uniformed personnel, the vast majority serve in Darfur (UNAMID), Abyei (UNISFA) and South Sudan (UNMISS). In related news, six Ethiopian soldiers who lost their lives in 2017 while serving in UN peacekeeping operations were posthumously awarded the Dag Hammarskjöld Medal, as part of the commemoration of the International Day of United Nations Peacekeepers. 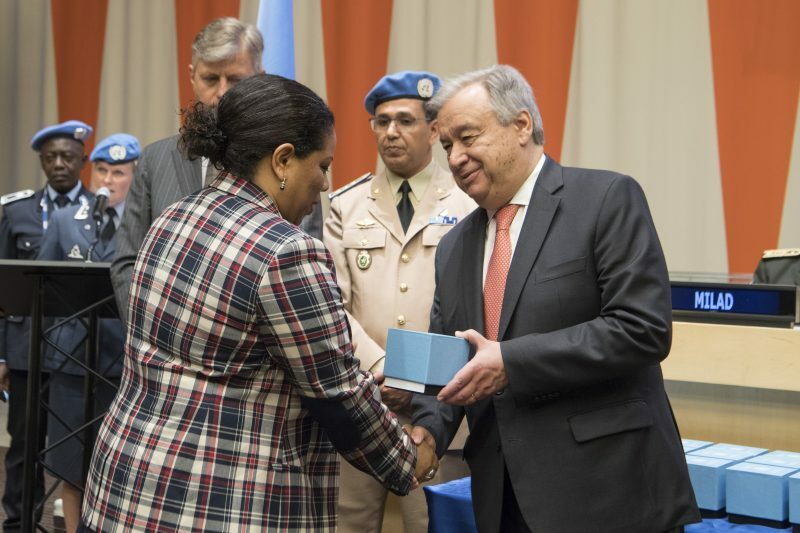 Ambassador Mahlet Hailu, Deputy Permanent Representative of Ethiopia to the United Nations, received the medal from Secretary-General António Guterres. Private Mohamed ABAWARE who served in UNMISS.